If Korea was ever in possession of top secret technology capable of reviving the dinosaur species, 단양 (Danyang) is where they would keep them. After a long 4 hour traffic congested bus ride, my boyfriend, his father (let’s call him Papa Song) and I finally arrived in 단양 (Danyang). Peering out the bus windows, there was nothing but blue waters for miles encompassed by lush forest covered mountains. It honestly looked like something out of Jurassic Park. Absolutely breathtaking and a bit surreal. 단양 (Danyang) is located in the North Chungcheong province of Korea. 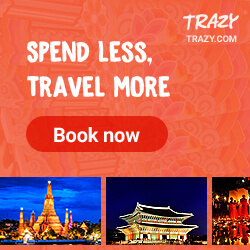 It has many beautiful scenic spots, but there are a few places in particular that are collectively known as the “8 Wonders of Danyang.” Unfortunately, these sites are so spread out that it’s impossible to view them all in one day. Since we decided to go on this trip with a tour group, our schedule was a little restricted. Nonetheless we still got to see some amazing sites. First up on our itinerary was a cruise along Chungju Lake, but thanks to traffic we missed the ferry and had to wait about an hour for the next one. However, this gave us time to just take in the view, grab some coffee and eat some amazingly delicious grilled potatoes. Once we got on the ferry, it was 1 hour of pure relaxation. The boyfriend and I kind of went crazy with the picture taking, but once we settled down we spent most of our time enjoying the view and brushing up on our Korean history with Papa Song. I loved the rock formations along the river. 구담봉 & 옥순봉 (Gudambong & Oksunbong) are two of the “8 Wonders of Danyang” that you can see. My favorite was 옥순봉 (Oksunbong). Its name literally translates to Jade Shoot Peak because its vibrant mossy top covered rocks seem to jut out of the waters like bamboo shoots. Staring at it from its base made me feel so small, it gave me this ancient or prehistoric impression. 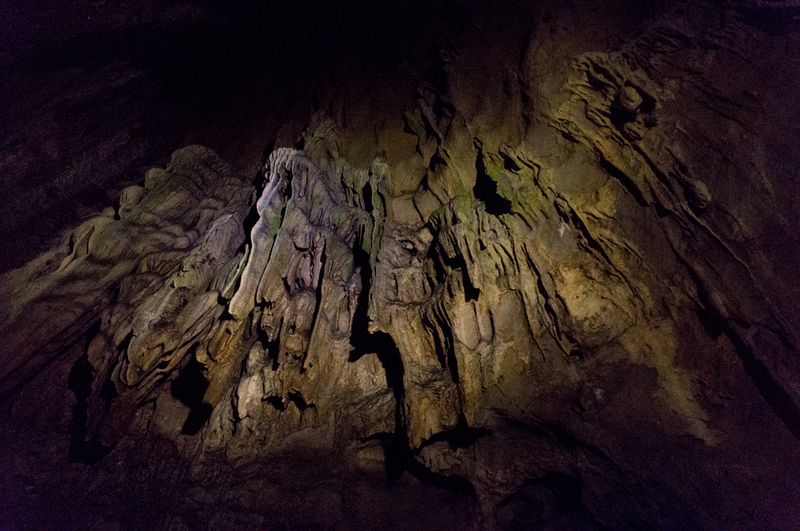 Our next stop was 고수동굴 (Gosu Cave), which is one of Korea’s most famous caves and is listed as “Natural Monument No. 256.” It formed over 450 million years ago and is 1.7km of twisting, turning limestone caverns. Although many people visit this cave, it hasn’t been modified to comfortably accommodate its guests. Rickety metal walkways and stairs have been installed, but many of the paths are so narrow you can barely crab walk through them. It’s also incredibly slippery with only some very dim lighting to help you out. So, if you’re claustrophobic, you may want to skip it. It’s not an incredibly exciting stop, but the unique natural formations, shimmering stones and randomly dispersed flecks of color are definitely worth seeing at least once. Once we reached the end of the cave, we were tired, hungry and glistening with sweat from the humidity. We only had about 30 minutes left to grab some lunch and there weren’t many food options in the area. Eventually we opted for some 냉면 (Naengmyeon – Cold Noodles) in an air-conditioned restaurant. The rest of the area outside the cave seemed like a bit of a tourist trap. Vendors sold a random mishmash of trinkets and souvenirs, including some very interesting fertility statues. Our last stop was the place Papa Song and I had anticipated the most, 도담삼봉 (Dodam Sambong) because it has such an interesting story. 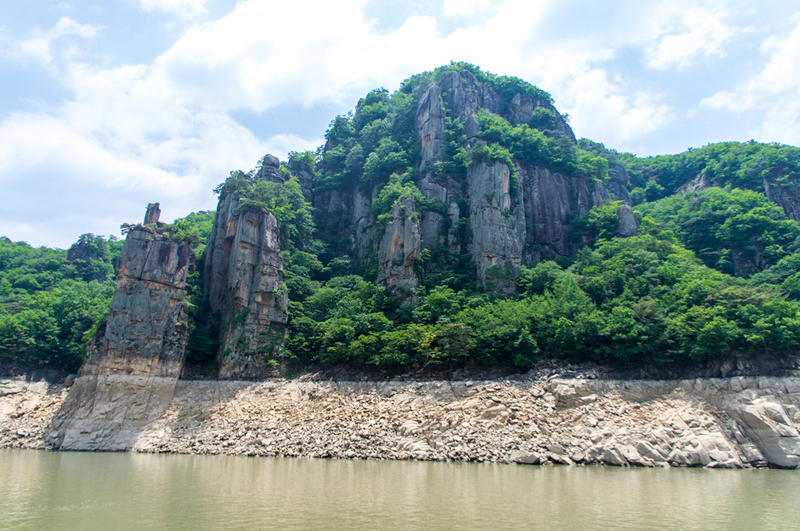 Sprouting out of the Nam Han River are three peaks named Changgun-bong, Cheop-bong, and Cheo-bong. These three peaks represent an ancient Korean love triangle. According to legend, there was once a nobleman whose wife was unable to give birth to a son. So the husband took a mistress who soon became pregnant with his child. If you look closely at the formation you can see that the biggest peak, with a pavilion on top, represents the husband. Close to his side is his mistress who is facing him with her pregnant belly. The wife who felt angry and betrayed stands further away from her husband and appears to be turned away from him. Just up the river was 석문 (Seongmun), which means Stone Gate. It formed when a limestone cave collapsed, and the remaining ceiling formed a sort of natural arc. It was a bit of a hike to see it, but when we got there it was so overtaken by the trees and shrubs that it was hard to tell what it was. Around 6pm it was time to make the long trek back to Seoul. Although we were completely exhausted it was a great day trip. I took a lot of great photos, explored a new part of Korea and got in some much needed family bonding time. The one thing I disliked was that we spent more time on the bus than off it, so it felt a bit boring at times. I think if we ever go back we’ll probably rent a car, bring my dog and maybe even stay in a pension for a night. With all the beauty of mother nature it would be a shame not to enjoy it at a more leisurely pace with man’s best friend. Tags: Culture, Danyang, Dodam Sambong, 단양, 도담삼봉, Korea, Nature, Photography, travel. Bookmark the permalink.